After my sweetheart made us breakfast with those tasty orange yoke eggs, we headed to the cemetery in Topla to see if we could find my grandfather’s grave. The woman from yesterday saw us approach and asked that we follow her as she went to get the priest from his residence. 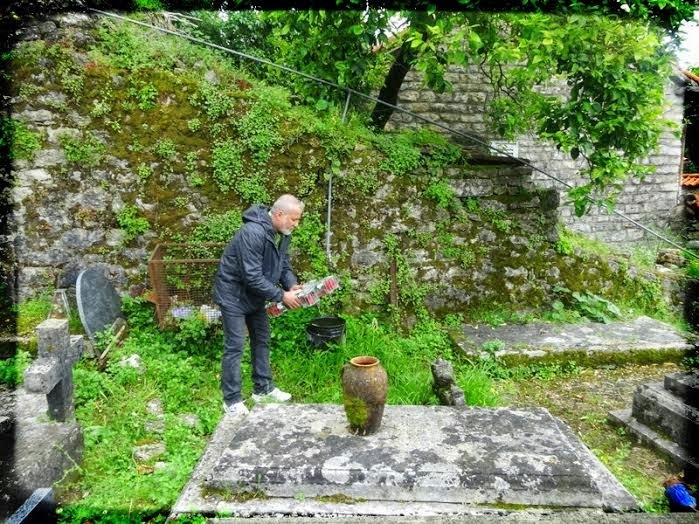 I introduced myself with the same name as the man whose grave we were looking for, as I was named after my grandfather, Dusan Mandic, pronounced Dooshun Munditch. Peter (Petar) is my middle name. The priest took us directly to his grave, and like the woman, he did not speak English. He was a very kind to us and I thanked him with my limited Serbian. We went across the street to a florist and bought a clear cross encased with white and red roses to rest on his grave for ever more. We did the same for my grandmother with hers encased in a heart. It was a solemn walk to the Old Town where we wondered to the top of Kanli Kula which means bloody tower and was built by the Turks in the sixteenth century. The top of the fort was used as a prison by the Turks but in recent times converted into an open air theatre. The views of Boka Kotorska (the Bay of Kotor) were spectacular. We stopped in the square outside one of my grandfather’s shops and had a delicious pizza and large beers, a bargain at 11 Euros, about $17. After lunch we continued along the promenade until we got tired, then returned home to rest my knee which got quite the workout.